Image by Andrew Whalley licensed under Creative Commons. Earlier this year, I moved to DC from Kansas City, Missouri. When I did, I said goodbye to my car. Getting around without one is totally doable, and I’ve written a guide to explain how. How do I get around? There are nine steps. Think of them as a Mazlow’s Hierarchy of Needs for transportation. Take what you need of these and create your own cocktail or hierarchy or pie of commuting alternatives. Do this especially if your only experience in DC is the area between the Capitol building and the Lincoln Memorial, which by the way is 2.6 miles long and takes 56 minutes to walk in its entirety. The Metro map, at its actual scale. Image by Peter Dovak used with permission. If you live pretty far out, don’t expect it to be easy to travel during rush hours on weekdays. Also, keep in mind that if your office isn’t in the city’s core, living in that core might not be your best move. If you live close to your office, you might wind up reaping the benefits of quality bars and restaurants along with big box stores and nearby trails. And there are still 20-60 minute trains into downtown and back out. If you’re like me and like being in the middle of everything, as I’ve managed to pull off as stroke of luck, by all means, stay where you are! Or, you may find family is close by, but work may change. Or work may just change. Or you start dating someone. As good chefs know, keeping a well-stocked pantry with your staples helps maintain some consistency in cooking. The same goes for your commute. With so many choices, you could travel so many ways. However, time and money are still finite and you want to maximize them both as you choose how to get around the region. Every day for me is a walking architecture tour. You may find that for yourself as well, so definitely start exploring on the sidewalks. Image by the author. You may find that even if you walk slow, you’ll get to your destination cheaper and faster, and with some physical activity built in. From where I live off Georgia Avenue, I often walk to Petworth, Shaw/Howard, U Street, and Columbia Heights Metro stations. And if I want more exercise, I don’t mind making Adams Morgan, Chinatown, Dupont, and Metro Center part of my walkshed. If the only things I needed to do were in walking distance every day, I would stop here, and I’d have a perfect budget and I’d be living in a perfect village. But we can’t all live in Clarendon. And because we all don’t just live in Clarendon and sometimes we want to go to a Smithsonian museum or a Nats game, we have to use more than our two feet. Also, what If I can’t walk? I’m still proud of myself for riding my bike, Lina, to a conference in Pentagon City. It wasn’t the longest journey ever, but it meant crossing the Potomac and taking on some very challenging hills! Here, I had just crossed the river from the DC monuments on the Mount Vernon Trail. Image by the author. First of all, if you haven’t ridden a bike in years, and you already know your balance isn’t the greatest, I would reach out to the Washington Area Bicyclist Association (WABA) and see when their next learn-to- ride class is. Then, I would go on Craigslist or to one of the local thrift stores and see where you can get a nice used bike. I’d also advise learning how to lock your bike down so all of it is there when you get back. I would not buy a bike from Walmart or Target. They may be cheap, but they’re also heavy, and at that point you might as well be riding a Capital Bikeshare (CaBi). Once you pay your $85 a year for a CaBi membership, you get 30 minutes free per bike and there are stations all over. I suggest you get a fob, even if you don’t plan on using it much. In DC, there’s often an uphill climb if you’re riding north of U Street and Florida Avenu, at least in the Northwest quadrant, and I’ll certainly admit that uphill rides can be a bit rough. Also, CaBi stations get sparse the farther north you go. In general, depending on where you are, there might be signs and markings that make your ride comfortable, or there might not be any bike infrastructure at all. 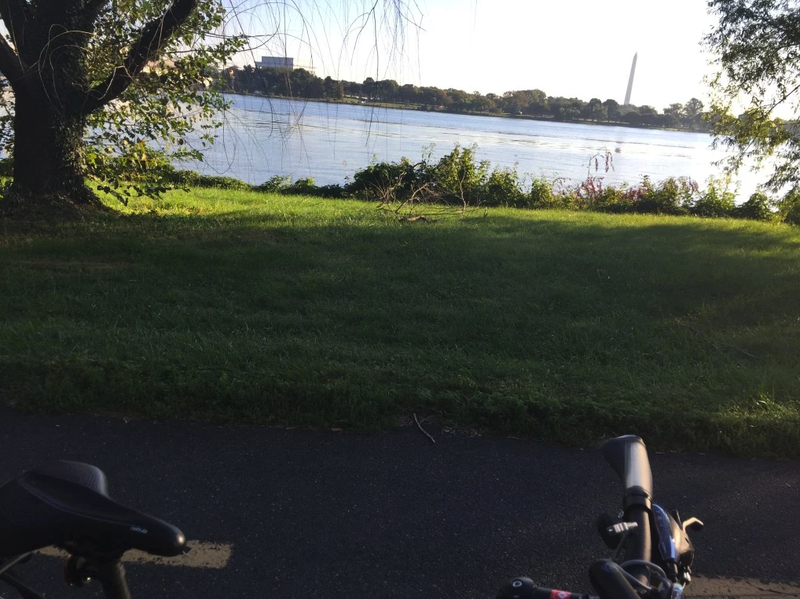 If you want a comfort map, which shows how easy or difficult it is to ride a bike in certain places, they’re out there for DC, Arlington, and Montgomery. Don’t look down on the bus. Especially when the bus helps your wallet and actually saves you time. Again, I live off of Georgia Avenue, and I like doing a few things and visiting people who live in Silver Spring. I also like being downtown quickly. The 70s buses help me do that quick and easy: I can count on it being 20 minutes in either direction, and I’m thankful I don’t have to walk. One day there will be no delays and I’ll get a good seat, but I can’t beat the $1.75 in each direction. The 79 is especially great for taking an express route to where I need to go. The Washington Post has a great primer on how to use the bus for the first time. Also, ask if your destination has a free or direct (or both) shuttle. This is what makes Potomac Mills Mall even possible, as well as the National Harbor, although both now have public transit routes. I doubt they will ever be in the Metrorail system and VRE, the Virginia side commuter rail, just scratches the surface of the Potomac Mills area, and not at a high frequency. Step 6: Take Metrorail. Or VRE or MARC, depending on which state you live in. Two trains at the Judiciary Square Metro station. Image by the author. Speaking of Metrorail. 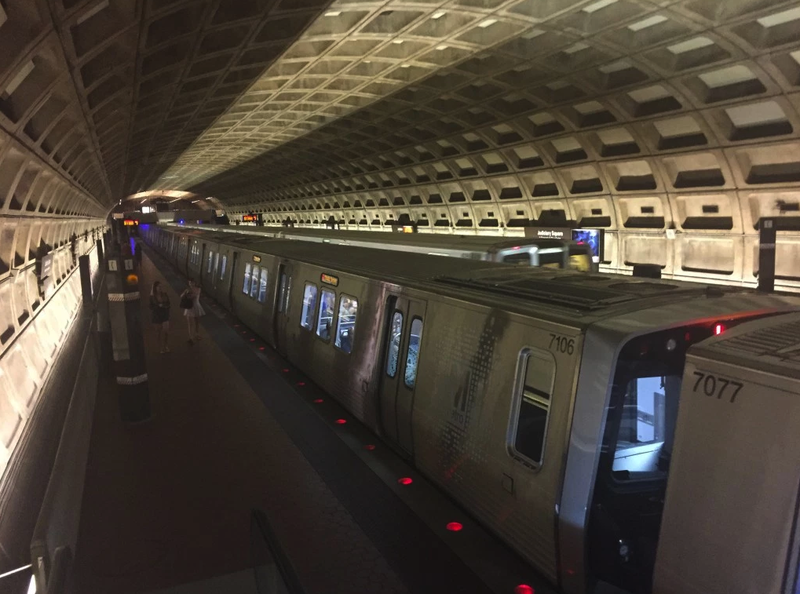 As of this writing, you may have not heard the best things about Metrorail, the thing you probably think about when you hear the word Metro used in reference to the train or any transit around the region. But it’s hands down the best way to cross the rivers, especially since you can take your bike with you. Also, I often use it to go to Capitol Hill (Eastern Market, to be exact) and down to the Waterfront/Nats Park areas. If you live farther out, it’s possible you won’t have as many rail options. But you may be able to use the Virginia Railway Express (VRE) or the MARC train depending on which state you live in or are commuting to and from. Honestly, doing this to Baltimore or BWI Airport will save you some sanity and money. Also, I keep my SmarTrip Card around my neck and I load it with a cash amount as needed. If I was doing more riding, of both the bus and the rail system, I'd invest in a pass. If you know you're primarily using Metrorail or Metrobus, or both, at least 3 times a week, then I'd go with one of the passes at the WMATA site. Also, the speciality ones do make great jewelry or bragging rights. You do need a different set of tickets for VRE and MARC, but you can go here and get tickets for everything transit and train related in the region. I’m trying to reduce my dependence on these two by dressing properly for the weather and being less afraid of walking home alone before 9 pm. However, for late nights, tight timelines, times when I think I’m walking or biking or busing the right direction but I’m really just lost, and carting stuff home from the grocery (although I’m looking into one of those carts for my Giant/Target trips), Lyft and Uber have been my lifeline. Oh, they’re also useful for when you have really good friends who live way out past Metro stops. This also applies when Metro is shut down and your bus drops frequency or stops running. I've not done it yet, but I've heard you can buy trips in bulk as well. I’ve only done one of these and that was so I could drive around a city that didn’t have as much transit on the opposite end of my trip. I have ridden in all but a Car2go with people who are members of these services. Again, this is what you do when you need to go somewhere that’s not as car-free friendly like Rehoboth Beach, or you need to haul a ton of things from a storage unit or boxes from IKEA (although I know someone who has carted a vacuum cleaner on Metro from Target) or there are really no other good options to get where you need to go. I only miss her at night, and when I'm tired and don't want to put in the work all these other modes require. 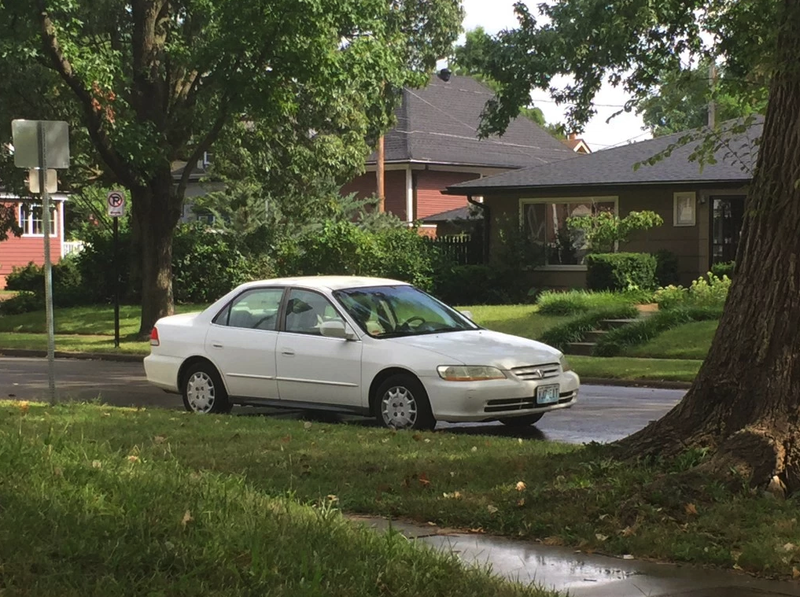 But then I think about the hurting I put on her on the streets and parking downtown…and the fact that I was already down to driving her only every other day or every two days even in Kansas City… I think she's in a happier place with her new owner. Image used with permission. Now, there are some good reasons for owning a car. Maybe you want to become an Uber or Lyft driver yourself, or you have a business that requires you to haul things, or a job that requires you to have a car. You might get on a Home Depot/Apartment Therapy kick as a self-care activity. Your kids may just cause you more trouble on the bus and Metro than its worth, if they even come close enough to your house. Also, if you’re somewhere that’s still not well served by transit or you have a social or work life largely away from transit, and you can park easilythen by all means, do get a vehicle of your own (or figure out how to get your vehicle here). Yes, this statement may throw out everything I’ve written thus far. But at the end of the day, I’m an advocate for a multi-modal future, not necessarily a car-free future. Finally, we are at the top of the pyramid! Your commuting and traveling equation may look different from mine, but if you’re looking to go car-free for the first time or in a long time and you also want to save money and be efficient on how you get around, consider my method or create a sustainable one of your own! Kristen Jeffers is a writer and advocate whose site The Black Urbanist shares her thoughts on land use and mobility from the perspective of a black Southern femme person, and helps other black urbanists worldwide share their story and find connections. 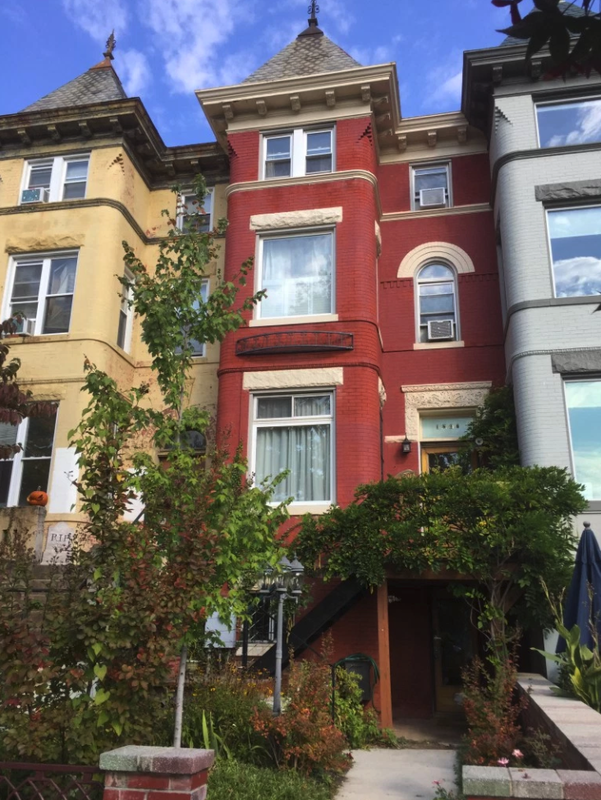 She's a native North Carolinian, and after trying out Baltimore’s Bolton Hill neighborhood, she's returned to DC’s Park View neighborhood and plans to stay for a bit.